KATHMANDU, Jan 19: The prime minister extended his cabinet for the fifth time adding two new ministers from the fringe political parties on Thursday. With the latest extension, the size of cabinet has reached 43, including state ministers. 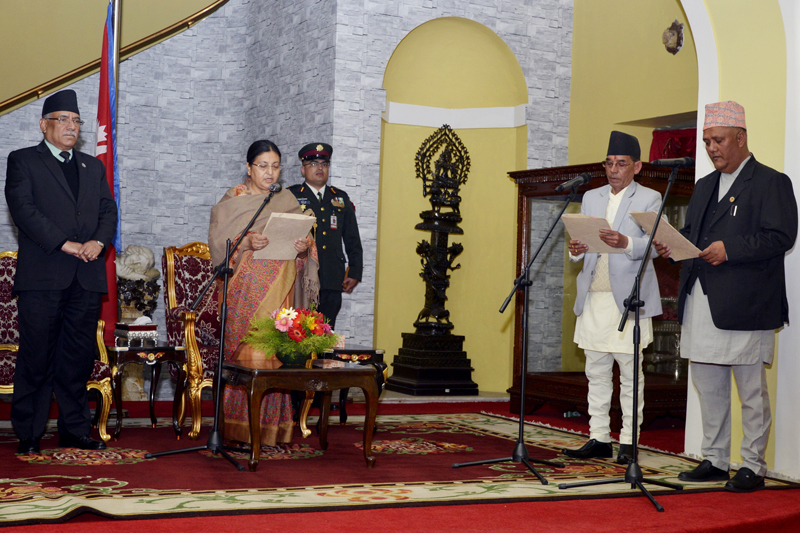 Newly-appointed Minister for Water Supply and Sanitation Prem Bahadur Singh and Minister for Women Children and Social Welfare Kumar Khadka took oath of office from President Bidya Bhandari later on Thursday at the Office of the President. Singh represents Samajbadi Janata Party and Khadka is from Akhanda Nepal Party. Both leaders are sole lawmakers from their respective parties in parliament. Dahal's decision to appoint ministers from the fringe political parties has been widely seen as an attempt by the prime minister to garner wider support for endorsing constitution amendment bill from parliament. Earlier, two political parties had quit the ruling coalition, after the government registered a constitution amendment proposal in parliament. Leaders of the ruling parties have said that negotiations are underway with the chairman of the Rastriya Prajatantra Party Kamal Thapa and Madhesi People's Right Forum Democratic Chairman Bijay Gachchhadar for inducting them into the government. Both leaders have sought powerful ministers and deputy prime ministership. The previous K P Oli-led government was widely criticized for the size of the cabinet, which had 41 ministers. But Dahal has surpassed Oli's cabinet size. Even though, article 76 (9) of the new constitution states that size of cabinet shouldn't exceed 25 members, political parties have been arguing that the Article doesn't bars adding more ministers during the transition.